Today, as I write this article, it shocks me that Pakistan is only left with 1.53 years to achieve Millennium Development Goals (MDGs). Government of Pakistan has adopted 16 targets and 41 indicators. Time series data is available for only 34 indicators and it reveals that Pakistan is on track to achieve the targets on 11 indicators, whereas its progress on 23 indicators is o­ff track. The recently held National Parliamentary Conference on MDGs, is a ray of hope that shows accelerated actions will be taken by legislators and constituents holder to help the country in this regard. But more needs to be done, and at various levels. Development practitioners and stakeholders must reassess need to analyze that what went wrong in these entire 13 years that have contributed towards the country’s inability to achieve its MDG targets and even produce the accurate data to track them. The whole development paradigm shift is required to have transformative thinking and a framework needs to be applied to achieve sustainable development. Out of the usual mental blocks, is the dire need of time to have critical approach towards sustainable development to avoid Pakistan from being in this situation when the post-2015 goals’ reach their deadline by 2030. This development state reminds me of Peter M. Senge’s model which understates that system thinking approach is required to see inter-relationships that underlie complex situations and interactions rather than looking at mere simplistic linear cause-effect chains. Therefore to unravel the often hidden subtleties, influences, leverage points and intended/unintended consequences of changed plans and programs and it leads to deeper, more complete awareness of the interconnections responsible for changing any system. But the question that remains is what we have learned from the MDGs to date? And also, how we can have mutual decision-making based on consensus on a top-to-bottom or via a bottom-up approach? Development sector needs to work more closely with private & corporate sector amid Corporate Social Responsibility. Of course, the unforeseen disastrous events (including disasters, conflicts, displacements) which occurred during this time have to be factored in as they have significantly contributed in the country’s inability to meet its goals. However, to really make a difference in the lives of the poor people, we ought to prepare well in advance as only an effective planning to meet developmental goals can safeguards nations from future losses. Additionally, aid dependence of the country also needs to be re-strategized in order to engage in more compact oriented actions which can show effective results. Inequality in accessing services and service delivery need to be examined through the lens of reducing these social disparities in the privileged and the under-privileged of the country, which can ultimately improve the access of the poor to treatment, care and support services. For instance we can look at the bottlenecks that can prevent people living in far flung remote areas to access clean and safe drinking water, access health information, education, employment and so on. We have to some extent we tend to accept things the way they are and lack the enthusiasm required for new innovative approaches. The corporate sector on the other hand is much more vibrant in that aspect. It focuses on thorough research of the supply and demand. In the development sector however, things are different and we tend to miss that important research and development link that can help us streamline our efforts to meet the targets. It goes without saying that the MDGs triggered a global vision as did the Sustainable Development Goals (SDGs), but what is required now is action at local, national and global levels on the deeply entwined health, education, economic, social and environmental challenges that confront the next generation. However, I will say that prosperity of any nation relies heavily on the health of its people. There is a need make early investments in all those disease in which Pakistan is at least on track, specifically HIV and AIDS. 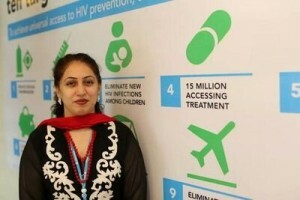 The post-2015 agenda should include a commitment to ending the AIDS epidemic by 2030 (by using technological aspects and research) provisionally defined as reducing new HIV infections, discrimination and AIDS-related deaths to 10% of 2010 levels such that AIDS no longer represents a major threat to any population or country. Human rights based approach should be integral to all health issues. Inclusive accountability mechanisms should be strengthened to enable broad participation and ownership in implementing and monitoring the post-2015 agenda. Ending AIDS will benefit from and serve as a catalyst for achieving a shared vision of social, economic and environmental justice. The AIDS epidemic’s interacts with poverty, conflicts, marginalization, exclusion, culture, law, gender dynamics, religion, unemployment, taboos and more has demanded that the response directly confront the political and social determinants of people’s risk-taking behaviors and vulnerability to HIV. This whole approach needs to have multi-sectoral approach rather than just health only. Business as usual is no longer an option for sustainable development. Thank you for this well thought out piece. The issue of social uplift and human development has never been on the national agenda. our only indicator has been the GDP. What results is the whole system being geared towards economic growth which is not sustainable. Now that we realize that working along the MDGs is crucial for international relations, partnerships and foreign aid, energies are spent in making unrealistic targets to appease our developmental partners. A prime example of this is the National Emergency Action Plan for Polio Eradication Plan (2011). Such an ambitious plan, widely applauded. Three years down the road and we see the polio count crossing 160 this year. There has been a lot of planning/strategy/frameworks applied in the social sector, but whats the need of the hour is transparency, accountability and an institutional audit. We must provide incentives for those who work, but punish those who dont, for irresponsibility where lives are at stake is criminal negligence. By what processes are particular innovations in health services delivery and organization implemented and sustained (or not )in particular context and settings and can these process be enhanced ,a clear knowledge gaps on which further research on the diffusion of innovations in service organizations should be focused and a robust and transferable methodology for systematically reviewing complex research evidence is required . Agreed that research has to be carried out in order to identify knowledge gaps. secondly South- South collaboration need to be encouraged for transfer of knowledge and technological aspects. Research and development needs to be promoted. In health sector, unless we have multi-sectoral approach, we will not be able to tackle the issue.